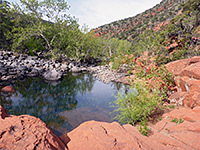 The Woods Canyon Trail is the southernmost hike in the Sedona region, and hence has the lowest starting elevation (3,860 feet), beginning beside Highway 179 at the Red Rock Ranger Station, from where the well-marked path heads east into the mouth of the wide canyon of Dry Beaver Creek. This seasonal drainage is bordered by sloping sides of greyish rock with a few red outcrops, and is not so interesting at first, as the trail winds through alternating grassy flats and patches of woodland, but becomes more scenic after a couple of miles, since from here onwards the ravine often contains pools and sections of flowing water. 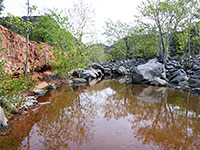 The valley gradually narrows and the path comes closer to the streambed, and a relatively large pool beneath a line of low red cliffs is reached after 2.5 miles, a good target for a shorter hike. The official path ends after nearly 5 miles at a larger pool adjoining a big area of flat red siltstone, across which the stream flows partly through a narrow, eroded channel; a very pretty and peaceful location. The canyon can be followed a lot further, though the many boulders, the narrowing valley and the dense vegetation make for sometimes slow progress. 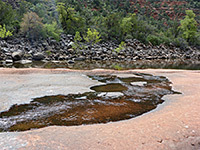 The pools are generally closer together, bordered by the same the same mix of grey and red rocks and eventually, after a somewhat drier stretch, the canyon enters a narrow, twisting, half mile section where the water covers all of the floor and the stream flows through shallow slots. This location is about ten miles from the trailhead and so would need a long, strenuous, all day hike to reach, but the round-trip journey just to the second large pool, at the end of the trail, is easily done in half a day. The upper narrows can also be reached via a forest track from the north, starting along Schnebly Hill Road. There are plenty of wildflowers in the canyon, reflecting the varied habitats of meadows, sandy flats, mixed woodland and riparian. Woods Canyon topographic map, Sedona location map. 15 views along the Woods Canyon Trail, panorama of the canyon. 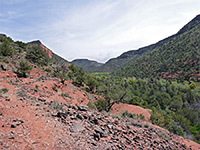 Woods Canyon is not so often visited, partly as the trailhead lies to the south of the Village of Oak Creek, away from the main red rock areas, and is not obvious, not signed from Hwy 179. The hike begins from the south side of the middle of the three parking lots in the Red Rock Ranger Station complex, a cluster of buildings on the east side of the highway, 8.7 miles south of the AZ 89A intersection and 8 miles north of Interstate 17. Facilities include a visitor center and rest rooms, and there is no charge for parking. The place is surrounded by sloping, bushy, earthen hills but with some red buttes visible to the north, including Courthouse Butte and Bell Rock. The path starts at a gate at the edge of the parking area, immediately entering long grass surrounding a protected section of flowing stream, which originates in Jacks Canyon, the adjacent valley to the north of Woods Canyon. The trail crosses the stream, and another channel, then moves through more riparian vegetation for a few hundred feet before rising to dry land and another gate, where a notice advises of the dangers of attempting (in one day), the 22 mile circuit of the Jacks Canyon and Hot Loop trails; this latter branches northwards off the Woods Canyon Trail. The route proceeds along a disused vehicle track over sandy flats then descends to a broad strip of grassland at the mouth of the canyon, beyond which the land is more wooded. 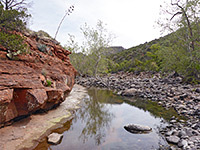 The path crosses a dry side channel of the creek a couple of times, and continues through tree- and bush-covered land before rising slightly to a red rock tributary wash, often containing a few residual pools. Soon after here - 2 miles from the highway, and a hundred feet above the valley floor - is the junction with the Hot Loop Trail, which climbs Horse Mesa to the north. A sign just beyond the junction marks the edge of the Munds Mountain Wilderness Area. The Woods Canyon Trail descends from relatively open slopes, back into light woodland, while staying a little way above the streambed, some parts of which now have pools or flowing water, always surrounded by big, rounded, grey limestone boulders. 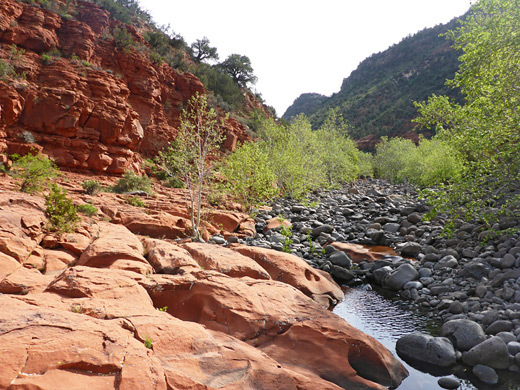 The path moves down to stream level near the point where a big tributary (Rattlesnake Canyon) joins from the south, and emerges from the woodland to a red rock terrace, between a pool and a line of low, red cliffs. This is one of the first places where the creek is bordered by sandstone outcrops rather than just boulders, or bushy slopes. The path, now somewhat narrower, climbs again, becoming a hundred feet or more above the canyon floor, and runs for a time along a flat bench above a line of taller cliffs, but is soon back down amongst the trees, closer to the streambed. It rises once more, through rockier, more uneven terrain and seems to fade away in the vicinity of the largest pool in the whole canyon - after 4.9 miles, at the end of the official trail. The pool is up to 300 feet long, 100 feet across and is fed by two branches of the creek, one flowing through a hundred foot-long channel across a big area of flat rock just upstream. All the rocks in the canyon are from the various sections of the Supai Formation; most are red sandstone and siltstone, some are grey limestone. The largest pool, near the end of the trail (1:16 min).